A UNIQUE 64-Team FBS Playoff: Exciting & Unpredictable! A 64-Team FBS National Playoff! Imagine the intense interest and incredible excitement a true 64-Team College Football Playoff would generate, gaining momentum week after week! March Madness would pale in comparison. Add in unique twists with a high unpredictability level and fans would be fascinated! Winning Your Place in the Finals On The Field: The players and coaches decide this. Not some “committee” of good ol’ boys who repeatedly favor the same schools. This would create much more interest among fans. The opportunity for “Cinderella” teams to advance, to knock off supposed “favorites”, would captivate the nation! Teams should WIN their way to the National Championship Finals! Randomly Generated Matchups: Instead of having opponents predetermined, like in the NCAA Basketball Tournament, not knowing in advance who you might play – for every team, even the losers – ratchets up the anticipation, excitement, and surprise. All 32 Playoff matchups each week are randomly generated by computer or blind drawing. This will be a great suspense builder, guaranteeing huge audiences for the pairing announcements on national TV! Losers’ Bracket: For the one-loss teams, did the ball bounce the wrong way once? Did the ref make a bad call? Did one of your key players go out? There is still one more chance at the title! How many times in the College World Series has the national champion been from the Losers’ Bracket? Parity, Teams with Similar Records in the Playoff Play One Another: Having teams with similar records in the playoff play one another should produce more competitive games, minimizing the blowouts that now typically occur when stronger teams play weaker ones. Plus, if even teams with two playoff losses can go to “bowl” games, then there is still incentive to win. The Top Four Teams in each Conference advance to the 64-Team College Football National Championship Playoff. Some conferences may have an undefeated conference champion, others with more parity may have their top four teams with one – two – three losses. Doesn’t matter. The top four teams in each conference advance to the National Championship Playoff regardless of their conference win-loss record. 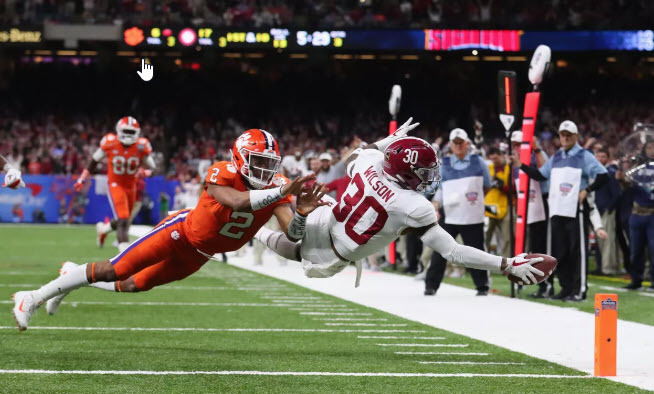 Alabama & Clemson: Would they make the National Championship Game in the “Irresistibly Delicious”? Data decides, not personal opinion. Ranking within the conference is based only on win-loss records and predetermined statistical data like points scored, points allowed, point differentials, etc., etc. No committees, sportswriter rankings or personal opinions are allowed to determine advancement. What of the bottom four teams in each Conference? Is their season over after seven games? No. They advance to the Redemption Playoff of the bottom 64 teams. The Redemption Playoff can use the same rules as the National Championship Playoff. This means the opportunity to become a National Redemption Champion. This will continue to keep the 12-game season interesting and meaningful for the bottom 64 teams and fans across America. 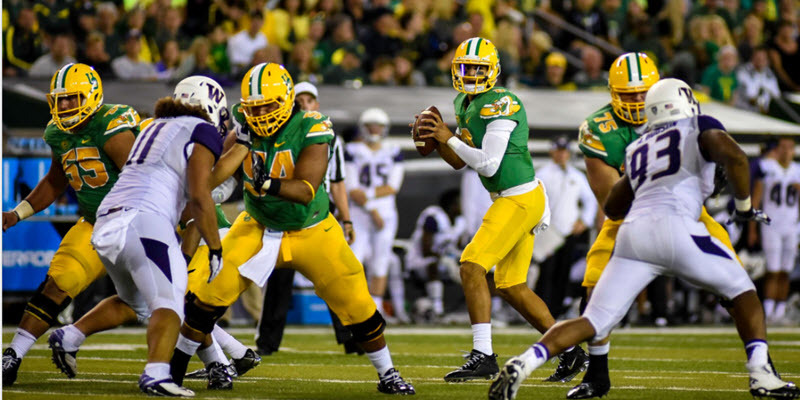 Marcus Mariota Leads the Ducks! ** Week One of the National Playoff (Week Eight of the Season): The “Regional Phase”. In the “Regional Phase” the #1 team within each conference plays the #4 team from a different conference within the same region. The #2 team within a conference plays the #3 team from a different conference within the same region. Matchups will be randomly generated. Games are held in the higher ranked teams’ stadiums. This is to reward the conference champions for their hard work. The 32 Games: 64 Undefeated Teams play 32 Games. ** Week Two of the National Playoff (Week Nine of the Season): The “National Phase” Begins. The “National Phase” begins. In week two, teams begin playing teams throughout the country in randomly generated matchups. All matchups are now based strictly on the teams’ playoff records. Teams with like playoff records play one another. Repeat matchups are to be avoided. The 32 Games: 32 Undefeated Teams play 16 games. 32 One-Playoff Loss Teams play 16 games. The 32 Games: 16 undefeated teams play eight games. 32 one-loss teams play 16 games. 16 two-loss teams play 8 games. The 32 Games: Eight undefeated teams play four games. 24 one-loss teams play 12 games. 24 two-loss teams play 12 games. Eight three-loss teams play four games. The 32 Games: Four undefeated teams play two games. 16 one-loss teams play eight games. 24 two-loss teams play 12 games. 16 three-loss teams play eight games. Four four-loss teams play two games. 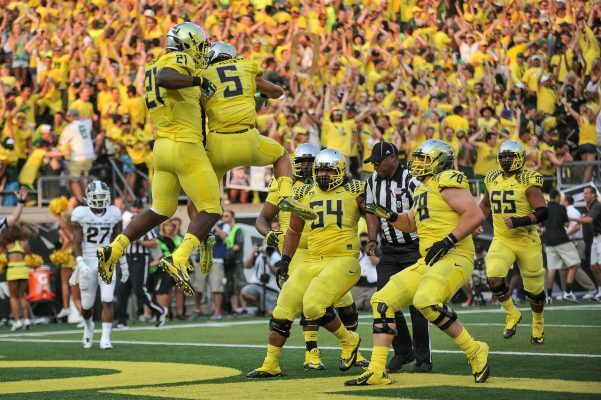 Oregon – Michigan State 2014. A dominating win for the Ducks! After the Week 12 games, the two undefeated teams advance to the National Championship Finals. Teams with one playoff loss either advance to the National Championship Finals or qualify for a “bowl” game. Teams with two playoff losses qualify for “bowl” games. The 32 teams with three, four and five playoff losses are done for the season. Redemption? The College World Series has a “Losers Bracket”, so teams are eliminated only when they lose two games. And isn’t a second chance for redemption the American way? Do we allow any one-loss playoff teams to enter the National Championship Finals? Why not? Share your thoughts. Please add your ideas (even the wacky ones) about how you would structure an FBS 64-team national playoff system. Remember, creative brainstorming is about contributing, not denigrating. Thanks. Join us tomorrow for . . . Article Five: The “Irresistibly Delicious” National Championship FINALS & BOWL GAMES. 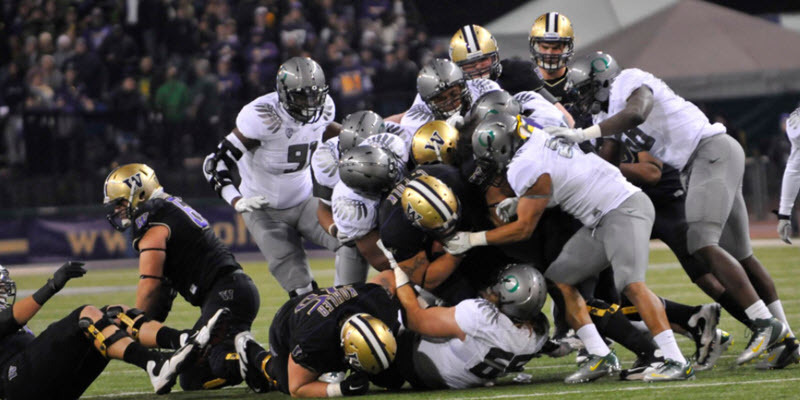 Article Two: Organizing a New FBS College Football Playoff System for MAXIMUM IMPACT! 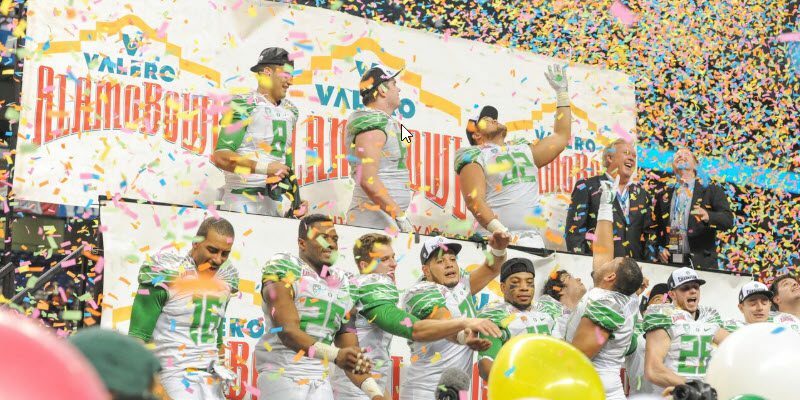 Article Three: Imagining a New 16-Conference FBS “SUPER-DIVISION” for College Football!